It was another busy transfer window with plenty of moves, twists and turns, unexpected signings, and a few rejections in January. There was Callum Hudson-Odoi's transfer saga, Gonzalo Higuain's arrival at Chelsea, Marko Arnautovic's West Ham decision, Barcelona's contrasting signings, and much more. The Christmas tinsel isn't even down and the transfer window is still closed but speculation begins surrounding the future of one of England's brightest stars. Sky Germany report Bayern Munich have offered Chelsea £13.5m plus add-ons for Hudson-Odoi but claim the Blues are holding out for at least £22.5m. No sooner does the window open but it is confirmed Colin Kazim-Richards is on the move for the 15th time - the London-born former Bury youth player moving to Tiburones Rojos de Veracruz from Mexican rivals Lobos BUAP. The 32-year-old's career has so far seen him play in Turkey, France, Greece, Holland, Scotland and Brazil. 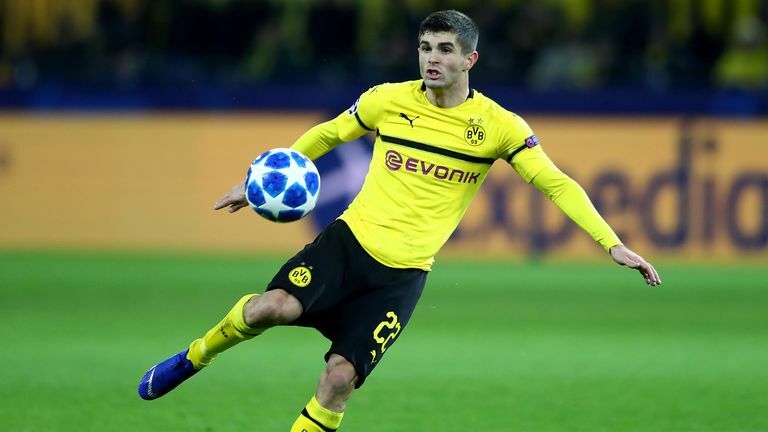 The first major signing of the month sees 20-year-old American international Christian Pulisic join Chelsea from Borussia Dortmund, although he is immediately loaned back for the rest of the season. "It's a privilege to have signed for such a legendary club," says Pulisic. Bournemouth make a double signing from Liverpool as they bring in Dominic Solanke and Nathaniel Clyne - the former for a fee of £19m and the latter on loan. Clyne's move infuriates Cardiff manager Neil Warnock, who calls Liverpool a "disgrace" and accuses them of lacking class after missing out on the defender. Also, remember Benik Afobe's summer transfer from Bournemouth to Wolves for £10m, only to be immediately loaned to Stoke City? The forward now makes the Potteries his home in a £12m deal - a profit of £2m for Wolves without Afobe making a single appearance. Forward Ross McCormack claims he is looking to get his 'mojo back' after joining Scottish Premiership side Motherwell on loan for the remainder of the season. McCormack played for Motherwell from 2006-2008 but had been playing in Australia since 2017. Jermain Defoe wraps up a move from Bournemouth to Rangers after signing an 18-month loan deal, with Southampton's Steven Davis also joining him at Ibrox on a temporary deal. Gary Madine joins Sheffield United on loan from Cardiff City until the end of the season and immediately has to deny he dislikes his new side. The forward was at city rivals Sheffield Wednesday between 2011 and 2015 and also famously insulted Blades fan favourite Billy Sharp in February 2017. Ever since Sharp has self-proclaimed himself as 'that fat lad from Sheffield' on his Twitter bio. Awks. Sky Sports News report Bayern Munich make a fresh £35m bid for Hudson-Odoi, reaching Chelsea's valuation of the winger. The bid, which does not include a buy-back clause, is Bayern's fourth offer for the England Under-19 star. West Ham reject a £35m bid from an unnamed Chinese club for forward Arnautovic, according to Sky sources. The Hammers say the player, who is under contract until 2022, is not for sale. There's some potentially frustrating news for Arsenal fans as Unai Emery reveals the club can only make loan signings this month. "We cannot sign anyone permanently," says the Gunners boss. Chelsea head coach Maurizio Sarri slams Bayern Munich, stating the German giants were "not professional" and "didn't respect our club" in their public courting of Hudson-Odoi. Fulham sign forward Ryan Babel from Besiktas on a permanent deal until the end of the season. Babel, who has 54 caps for the Netherlands, has played for a host of clubs since his three-and-a-half year spell at Anfield, which ended in 2011. He tells Sky Sports that he has "unfinished business" in the Premier League. Meanwhile, Steven Caulker, famous for a surprise January transfer loan move when he joined Liverpool from QPR back in 2016, joins Turkish side Alanyaspor as a free agent. Remember when Steven Caulker played as a striker for Liverpool? Transfer talk takes a backseat as Marcelo Bielsa says members of his Leeds coaching staff have watched training sessions of all their opponents before playing them this season. 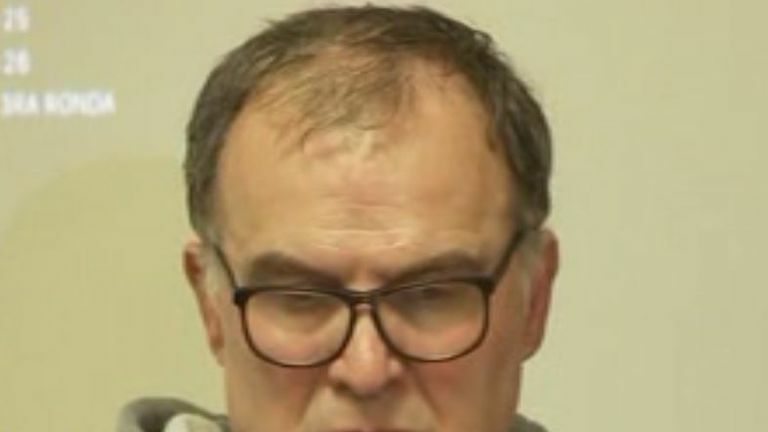 Having previously admitted to watching Derby before their match, Bielsa talks the media through an hour-long Powerpoint presentation detailing his tactical analysis and preparations. The presentation is described as a "tactical masterclass". Aaron Ramsey signs a pre-contract agreement to join Juventus from Arsenal in the summer, according to Sky Italy. Ramsey joined the Gunners from Cardiff in 2008 but was told in October he would not be offered a new deal at the Emirates. Cardiff City announce they have signed striker Emiliano Sala from Nantes for an undisclosed club record fee. Just three days later, the plane carrying the 28-year-old, and pilot David Ibbotson, from Nantes to Cardiff goes missing. The search is called off following three days of scouring the English Channel. There are tributes to Sala in Cardiff and Nantes while French sports agency Sport Cover set up a GoFundMe page aimed at relaunching the search. Ashley Cole reunites with former England and Chelsea team-mate Frank Lampard as he joins Derby County as a free agent until the end of the season. The 38-year-old defender - and three-time Premier League winner - has been without a club since leaving LA Galaxy in November and will play under Lampard at the Rams. Elsewhere, former Tottenham and Portsmouth forward Kevin-Prince Boateng makes a surprise loan move to Barcelona from Serie A side Sassuolo until the end of the season. Tottenham still haven't signed anyone in the 2018/19 season, but could that change after a double injury blow with Harry Kane and Dele Alli both ruled out until March? Liam Rosenior says Spurs need to make a signing in January if they are going to have a successful season. Former Liverpool and Manchester City striker Mario Balotelli leaves Nice to join rivals Marseille on a six-month deal. 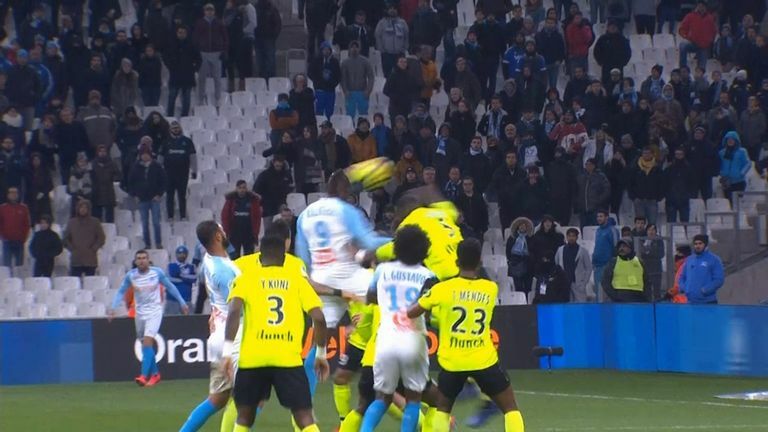 And the Italian quickly goes about repaying his fee with a debut goal in Marseille's 2-1 home defeat to Lille. Meanwhile, Barcelona confirm Ajax star midfielder Frenkie de Jong will join the club on July 1. Considered one of the best young players in world football, the 21-year-old joins on a five-year contract for a fee of £65m (€75m) with a further £9.5m (€11m) in add-ons. Another big January transfer deal also sees Higuain join Chelsea on loan from Juventus for the remainder of the season. Higuain worked for Sarri at Napoli and Chelsea have an option to sign the striker on a permanent deal for £31m in the summer. 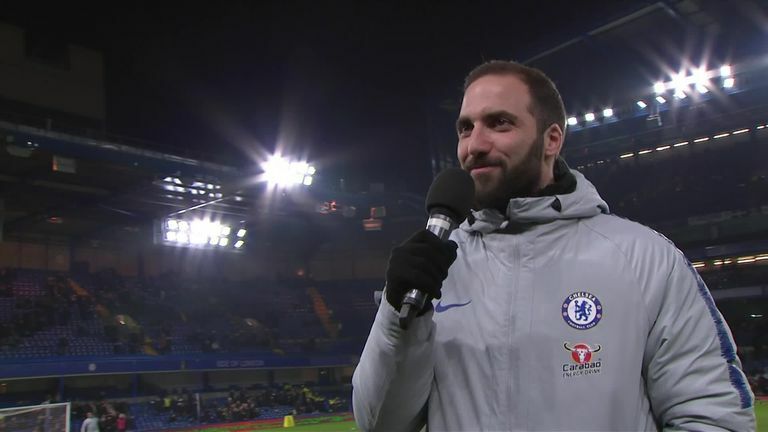 Gonzalo Higuain received a warm Stamford Bridge welcome prior to their semi-final in the Carabao Cup semi-final against Tottenham. After 20 games and three months in charge, Thierry Henry's time at Monaco comes to an end. He is initially suspended before it is confirmed that he is being replaced by his predecessor Leonardo Jardim. Henry leaves Monaco in the Ligue 1 relegation zone after only five wins in all competitions. Arnautovic takes to social media to insist West Ham "feels like home", ruling out a move away from the club. The forward had attracted interest from two Chinese clubs, believed to be Shanghai SIPG and Guangzhou Evergrande, and Sky sources understand West Ham rejected a £35m bid for him. The Hammers are believed to have told Arnautovic he could leave the club if they receive an offer worth £50m. The Austrian then signs a contract extension with the Hammers. Hudson-Odoi hands in a transfer request in a bid to secure a move to Bayern Munich, according to Sky Sports News. The 18-year old has refused to sign a new contract at Stamford Bridge, said to be worth £85,000 a week, and believes his future lies with the Bundesliga team. One English youngster who is definitely on the move is Josh Maja, joining French Ligue 1 side Bordeaux for an undisclosed fee from Sunderland. The forward signs a four-and-a-half-year deal after rejecting a contract extension with the Black Cats. Arsenal's loan offer for Ivan Perisic, with an option to buy for £34.5m, is rejected by Inter Milan, according to Sky Italy. The proposed deal for the Croatia winger included a £4.4m loan fee. January 28: Hudson-Odoi, Gueye to stay? 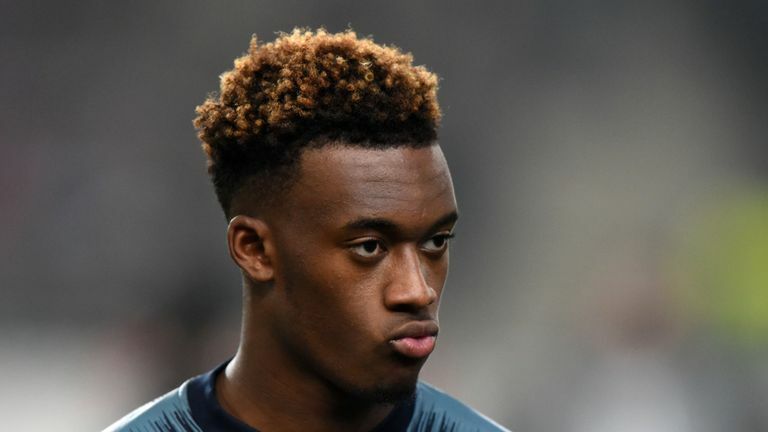 With just a few days of the window remaining, Chelsea make their final stance regarding Hudson-Odoi as they reject his transfer request. Idrissa Gueye has asked to leave Everton, begging the club not to end his dream of joining Paris Saint-Germain. However, Everton are determined to keep hold of the midfielder. Meanwhile, Warnock speaks to the media for the first time since the disappearance of Sala. He says he has considered retirement after the most difficult week of his career. Alvaro Morata completes his move away from Chelsea, joining Atletico Madrid on an 18-month loan deal. Gueye hands in a transfer request at Everton in a bid to secure his dream move to PSG. Marco Silva confirms that PSG have made an offer, but that it has been rejected. Atlanta United player Miguel Almiron arrives on Tyneside hoping to seal his transfer to Newcastle United. Meanwhile, Denis Suarez lands in London looking to secure his loan move from Barcelona to Arsenal. Hudson-Odoi does not feature for Chelsea in their 4-0 defeat to Bournemouth but his chances of being allowed to leave the club in this window look to be fading. Newcastle break their transfer record for the first time in 14 years as they confirm the signing of Almiron. Wolves convert Jonny Otto's stay at Molineux into a permanent deal but the other big Premier League deals of the day are loan moves as Arsenal complete the signing of Suarez and Leicester get in Youri Tielemans from Monaco. There's late drama as Michy Batshuayi needs a deal sheet and extra time to complete a loan move from Chelsea to Crystal Palace - but Everton reject PSG's bids for Gueye. However, perhaps the most eye-catching acquisition is that of Peter Crouch who makes his Premier League return by joining Burnley from Stoke.